WYATT PARK CHRISTIAN CHURCH was organized in 1880 as a mission of First Christian Church to serve the newly annexed “Wyatt Park” neighborhood. The first building was a small Gothic style frame church, which served until the 1920’s when the present building was constructed at 27th and Mitchell Avenue. 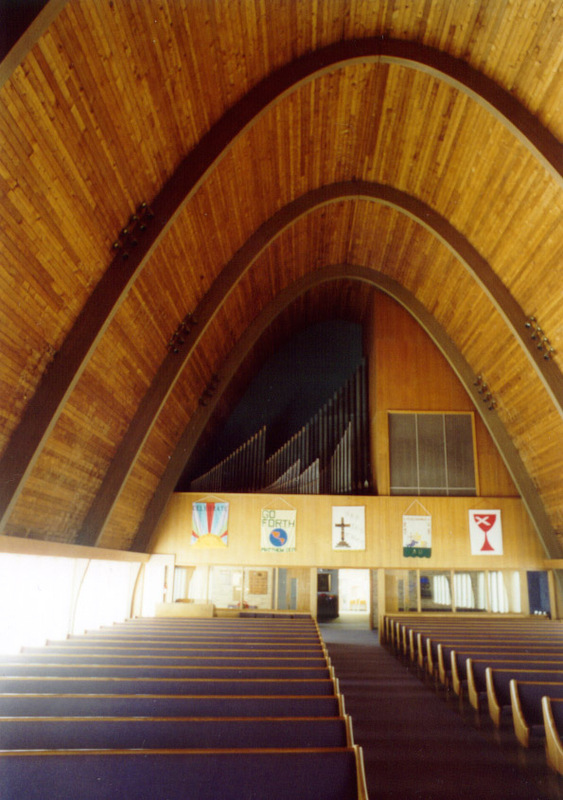 In 1957, a new sanctuary was built featuring a parabolic roof and a large stained glass window representing the Creation by the Frei Studio of St. Louis. The church contracted with a local organbuilder, who planned a new organ utilizing used components and later defaulted on the job. W. A. Brummer was hired to complete the organ, utilizing what he could of the assembled parts, including a duplex chest from an Aeolian residence organ, which serves as the main Swell chest, making the pedal borrows possible. The resulting free-standing gallery installation has 28 ranks, including the Choir organ, located in the Chancel.